Lapiglove is a young French brand created in 2012 by Karen Giguel. 100% Made in France and hand-craft, it produces the Lapiglove : it's a natural cleansing glove that removes all traces of makeup even waterproof using only water and no other makeup remover. Say goodbye to remover lotions and products, disposable cotton and wipes ! This revolutionary product will make savings, avoid any allergy risk and help you reduce waste. 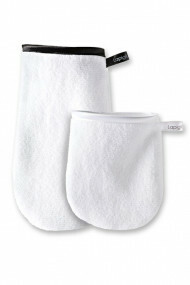 Lapiglove, the water makeup remover glove, economic, organic natural, allergy-free and efficient : it's love at first wipe !